THEN then La Palma will use 25% of the revenues to switch to CFL lights. 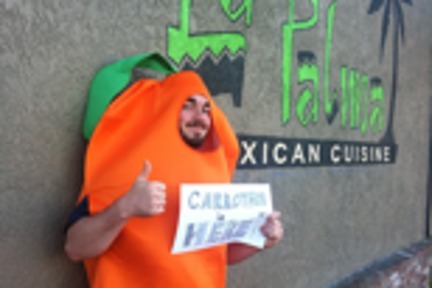 Come by La Palma Mexican Cuisine for some delicious food on Saturday, February 23! The University of the Pacific's Council of University Social Entrepreneurs and La Palma have negotiated that 25% of the day's revenues, or more if over 300 participants attend, will go towards switching to more environmentally friendly business alternatives. La Palma has agreed to install CFL lighting and procure more energy efficient refrigerators. The restaurant will provide a delicious meal for every person that comes in with a pre-purchased ticket. With this opportunity, not only will students be able to explore a bit more in the community by trying a new restaurant, but they are also actors in a social change movement, providing positive incentives for businesses to help make more environmentally friendly decisions! We care deeply about the University students' involvement in the community, and what better way for everyone to get involved than to eat while saving the world!